A home warranty is a service contract that covers the repair or replacement of important home system components and appliances that break down due to normal wear and tear over time. To quote, you only need five rating variables: state, home size, home type, service fee and additional add-ons. A customer may add on optional coverages for an additional fee. 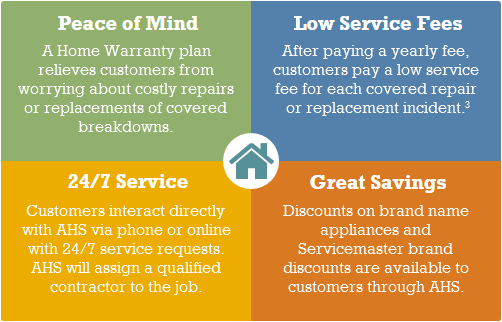 You don’t pay for the actual repair or replacement cost for items covered by the Home Warranty. The contract will cover repair or replacements of covered items, regardless of age, make or model. See a sample home warranty contract from AHS for details about the coverage, including exclusions, restrictions and limitations. Safeco also offers an equipment breakdown endorsement for home policies. 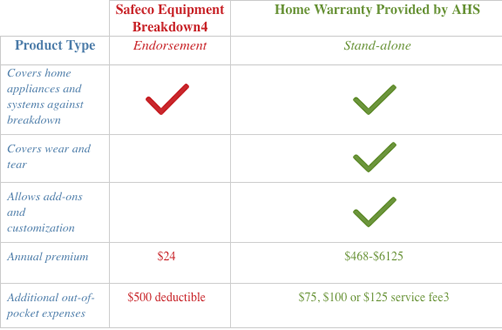 The table below outlines the differences between equipment breakdown coverage and a home warranty. We know how to find discounts on home warranty insurance you may not find on your own. Give us a call or send us a message today.